FIG president Chryssy Potsiou is looking back over the year 2017: "The year 2017 was rich with activities and experiences for all of us. We learnt to recognize the value of the globalization of our profession..."
The year 2017 has been eventful for FIG and is the third year of the current leadership (2015–2018). 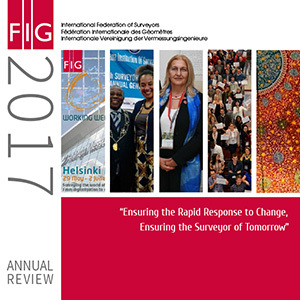 In this Annual Review please find a brief overview of FIG activities and the involvement with members and other organisations and entities throughout 2017. The annual review will be sent to all members together with the minutes from the 41th General Assembly in Istanbul, Turkey.